One of the most difficult aspects of customer loyalty is learning how to measure it. You can ask a customer how you did, but some people aren’t likely to really tell the truth. Some may not like telling you to your face (or even over the phone) that they were dissatisfied and will drop out. Others may feel put on the spot and simply say it was fine and would recommend, rather than going into detail about their experience. Often, the first time a business learns that someone was upset is when they leave a negative review. Average Lifetime value of your Customer: this is the amount your customers spend with your company, from the first day. And finally, the NPS, or Net Promoter Score. It does involve asking customers how you did, but it makes it a little easier by quantifying the user’s experience. Instead of asking them how you did, you simply ask, “On a scale of zero to ten, with zero being not at all likely and ten being very likely, how likely are you to recommend my business to a friend?” It’s often easier for a customer to answer this because they’re given a set range and options. 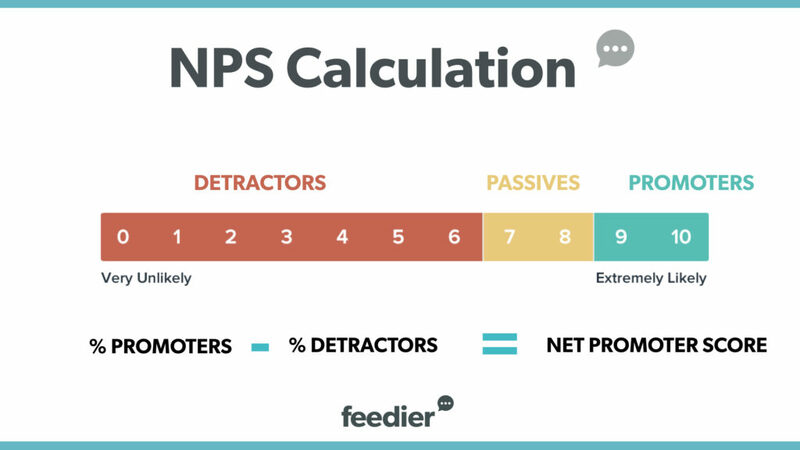 How Is The Net Promoter Score (NPS) Score Calculated? Calculating the score for your Net Promoter Score survey is fairly straightforward. The first step is to disregard all of the Passives. Next, calculate the percentages for both Detractors and Promoters by dividing the number of Detractors by the total number of responses. Do the same for the Promoters. Now subtract the Detractor percentage from the Promoter percentage to get your NPS. This is your net increase from recommendations. You can expect to see 40% of your customers recommend you, but that number has to be offset by the 20% who are telling people NOT to use your company. Since you’ll be losing about 20% of your potential customers from these bad reviews, that counters part of the customers you’re getting from the positive reviews. It’s possible that you can have a negative NPS. If that’s the case, you’re losing a large number of potential customers due to poor customer satisfaction and need to make changes as soon as possible. Any score under zero should be concerning, especially if it’s closer to -100. While every company wants to see an NPS of 100, that’s not always possible. In general, 50 is considered an excellent score, while anything about 70 is outstanding. You can benchmark your Net Promoter Score against 500+ leading companies using this NPS Benchmark database. Note that the average Net Promoter Score differs by industries and verticals. Asking for the likeliness of recommending your company is a great quantitative metric you can rely one. But you it doesn’t clearly give you indications about the why. This is the qualitative feedback that gives you this, bringing the true voice of the customer. In order to figure this out, you have to follow-up with an open-ended question after the NPS question. We clearly recommend to segment and change the wording based on the NPS score. For instance, for the promoters, you could ask them questions such as: “What do you like the most?”, “What could we do even better?”. On the other hand, for detractors, we could ask questions such as: “What is the primary reason for your score?”, “What disappointed you?”. As for any human interaction, the wording and tone you use will have great impacts on the results. You can not only rephrase the wording of the main NPS question, but also the follow-up question, the thank-you message, and the initial request. Although they all have a standard format that most companies use, they can be customized according to your business specifics and the goals. This question works great when you want to get a general feeling for your customer satisfaction and customer loyalty. It does not target any specific area of your business, making it a good choice to open the line with your new customers. Instead of being generic and asking about the company or product, you could also shift the focus towards a specific product, service, or even product features. This would be a great way to get product feedback, measure the satisfaction for specific use-cases and adjust the roadmap accordingly. 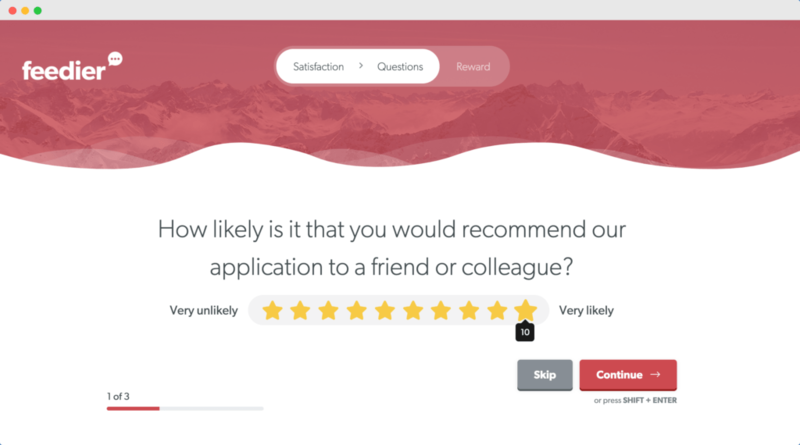 You can also add additional information to your question, such as the scale of the question: “On a scale of 1 to 10, how likely are you to recommend our company to a friend?”. Finally, you can apply this same process to the thank-you message, NPS email request and follow-up question. To wrap this up, there are no one-size fits all NPS wordings. You must consistently A/B test and optimize your campaign. Find what works best, and take it from there. Doing Net Promoter Score survey is important because it gives you insight into your customer loyalty. A higher NPS means that your customers are very satisfied with the experience they have with your brand and are likely to recommend it to others. While there’s no way to accurately measure word of mouth advertising, NPS does let you know if word of mouth about you is positive or negative. It also helps you determine if you’re likely to get repeat customers or if customers will be canceling subscriptions or other services. In terms of finances, it’s more expensive to bring in new customers than it is to retain loyal ones. It also has a bigger impact on sales. One study indicated that improving your customer retention by as little as five percent can result in a sales increase of anywhere from 25% to 95%. 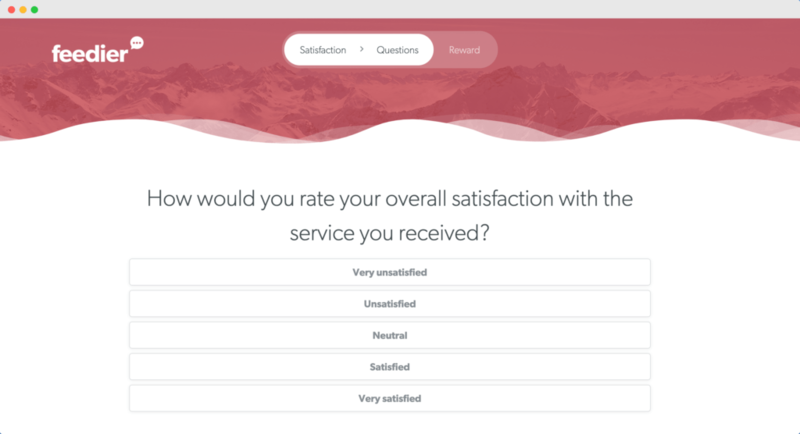 There’s never a bad time to do an NPS survey, but it’s especially important to conduct one if you believe you may have more negative customer satisfaction than positive. Another indicator that you need to calculate your NPS is when you see more and more of your existing customers leave for your competitors. A rash of people unsubscribing from your services, even if it’s just your email newsletter, could be a sign that you’re losing customers. Conducting a Net Promoter Score survey is fairly simple. You can have paper surveys placed near the register in a brick and mortar store. For customer service phone calls, you may have an automated survey at the end of the call, or you can have your representatives ask the customer about their experiences. For online support, a simple website form is all you need. In addition to asking if a customer is likely to recommend your services, it’s also a good idea to leave a space for the customer to explain their rating or add comments. This can help you identify where your customer service is breaking down. Note that not every customer will respond to your NPS survey. In fact, most of them won’t. A good response rate is between 30 and 40%. What is Employee NPS, usually referred to as eNPS survey? Another method of evaluating your word of mouth recommendations is by looking at your company’s Employee Net Promoter Score or ENPS. This score indicates how likely your employees will recommend your company to others. It’s determined using the same method as your NPS. Unlike NPS, however, a good ENPS score is actually much lower. Anything between 0 and 30 is usually considered good, while a score of 50 or greater is excellent. If your ENPS is in the negatives, it means you may have an employee satisfaction issue on your hands that needs to be addressed. Your ENPS survey can be voluntary or mandatory, which means you may have 100% participation, or you may see only a handful of employees participate. This survey could be anonymous, so your employees don’t feel as though they’re putting their job in jeopardy by answering negatively. It is a great way to identify the promoters among your employees and give you an idea of how to improve employee satisfaction. What Are Some NPS Alternatives? There are some alternative methods for measuring word of mouth and customer satisfaction. The Customer Effort Score, for example, asks customers how much effort they felt was required to make use of a product or service. It’s usually rated on a scale of one to five or “Very Difficult” to “Very Easy”. This gives you an idea of how much effort customers have to put forth to make use of your products and services. Customers who find products or services to be difficult or very difficult may be more likely to seek out easier to use services in the future. The Customer Satisfaction Score is another alternative. It simply asks how satisfied the customer was on a scale of one to five. No matter how you measure customer satisfaction, it’s important that you do it. It is not a one-off action. You have to constantly and consistently seek feedback, build a feedback-friendly company. Involve your customers and build the future with them. Remember that your customers are human, they don’t like to receive spam or non-personalized content. Make sure to personnalize everything, segment and ask the right survey question. If the NPS does not fit, find something else. It is also important to act quickly, respond to every single feedback and close the loop with your customers. With many customers looking at reviews before making a purchase, negative customer satisfaction can do more damage than ever before. On the other hand, treating all customers the same way will help you increase your overall reputation and turn your detractors into promoters, aka. unhappy customers into raving fans. Knowing when you need to work on improving your score is absolutely vital to your company, especially when you want to grow your customer base. Start creating your NPS survey for free today at feedier.com/go. Rick Bannerman is a technical marketer with a broad range of experience in marketing automation, integration, and analytics. He is also the founder of PLEXKITS, a company providing easy to use tools and Excel templates for marketers.